Whisk together flour, milk and salt in a small saucepan. Cook over low to medium heat until think (whisk constantly so you don't get any lumps). I consider it thick when it becomes difficult to whisk. Cool. Beat butter, shortening, sugar and vanilla until light and fluffy. Add flour mixture and beat again until light and fluffy. Beat slowly at first until incorporated and then at a high speed. A KitchenAid stand mixer with the whisk attachment, if you have one, is recommended. This may take a little time so be patient. Lick the bowl from the cupcakes while you are waiting. Stores well in the refrigerator. However, whip it up again before using because it tends to separate a little. congrats on your self restraint, i don't think i could be as strong, those look amazing!!! Those cupcakes are making me drool. 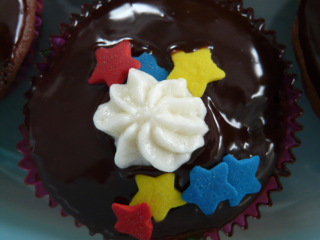 I love the little stars and that chocolate ganache is exquisite. Thank you for the recipe and a very happy birthday to your sister Heather! Oh my goodness.... those are delicious looking - I'm getting hungry just reading the recipe! I just want to reach in and grab one!!! They look simply delicious! 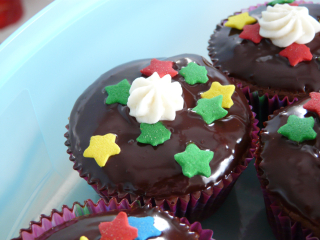 How do you make your ganache so shiny! I love reading your blog...it makes me miss Milwaukee!